Evia (Euboea) is the second largest of the Greek Aegean Islands and the second largest Greek island overall in area and population, after Crete. It is separated from the mainland of Greece by the Euripus channel, so narrow that it changes direction every three hours. 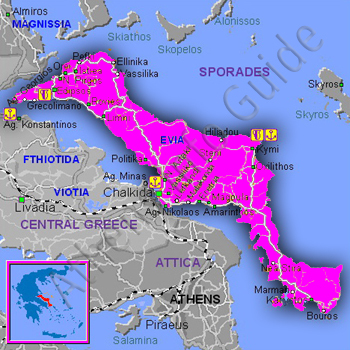 Euboea was believed to have originally formed part of the mainland, and to have been separated from it by an earthquake. The history of the island is for the most part that of its two principal cities, Chalcis and Eretria. Both cities were Ionian settlements from Attica, and their importance in early times is shown by their numerous colonies in Magna Graecia and Sicily..